The day after arriving in Lima, Peru, we decided that we needed to shake off the cobwebs of our long red-eye flight from Canada. There was absolutely no better way to do that than by getting our adrenaline pumping by riding dune buggies. 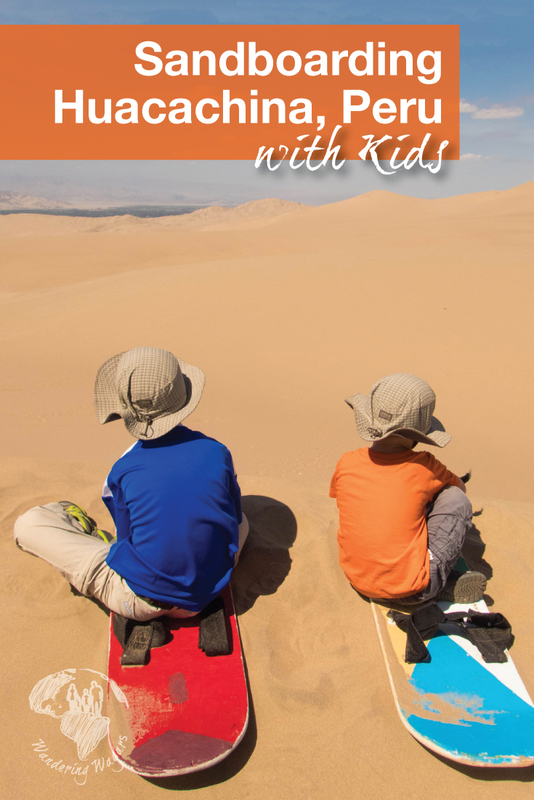 What better a way to go Sandboarding Peru with Kids in Huacachina! You can read our entire two-week Peru itinerary here. Check out our video for all the action. Make sure you subscribe as well so you can hear about all our latest content! The drive to Huacachina from Lima is a long one. The entire route takes about 5 hours. We dragged ourselves out of bed at the deep-dark hour of 4:00 AM and met our tour guide, Alberto, from Lima Discover Tours. We loaded into the incredibly comfortable van that they had provided, with layback seats. The guide and driver were friendly enough to let us almost immediately pass out and enjoy the first part of the long drive in the bliss of sleep. Read about why you shouldn’t skip out on Lima, Peru here. Christina and I awoke after a few hours. We gazed out the window, taking in the beautiful sunrise over the mountains along the Panamericana Sur route. 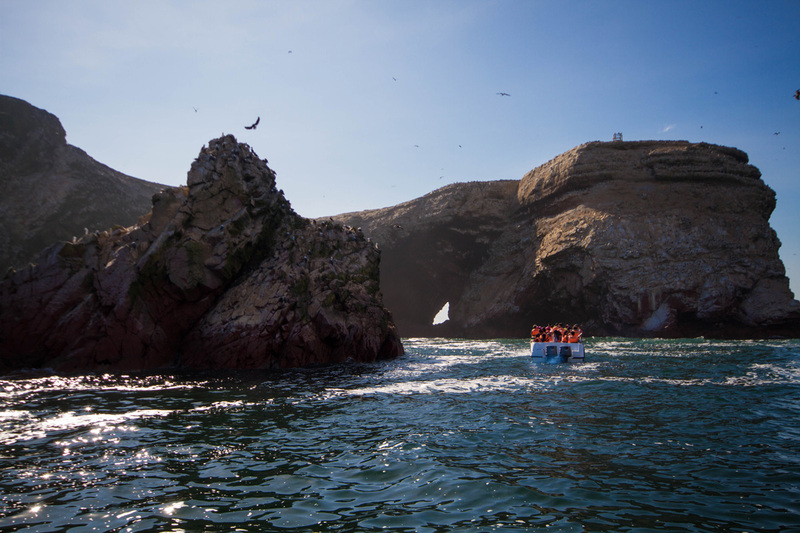 We made a great time, and at 7:30 we had arrived in Paracas to check out the Reserva Nacional Islas Ballestas. The fresh air and ocean breeze were exactly what we needed to get our head back in the game. We headed to shore. We were ready to continue on towards Ica for our chance to go sandboarding Peru with kids! You can read about our experience at the Paracas Nature Reserve here. As we pulled into Huacachina, it was clear from the start that this town is about one thing. Adrenaline! Between the buildings lined with sandboards, the decked out tuk-tuks, and the hugely lifted dune buggies, it was as though all the extras from Mad Max convened in one town. Huacachina isn’t hard to get around. The town itself is a suburb of the much larger city of Ica and has a population of just 100 people. The vast majority of the town is restaurants and shops, but at its center is the oasis. This is a perfect spot to have a drink or an ice cream and people watch for a while. For about 30 soles, you can rent a rowboat or paddleboat and cruise around the lagoon. It makes for a great vantage point to see all the action. We wasted no time loading up into our own insane looking dune buggy. The boys insisted on climbing into the buggy themselves, and after a short time, we were on our way towards the golden hills of sand. The drive out of town took us past a small desert pond, which sadly was filled with garbage. Peru has a massive litter problem. The view of tepid, brown water strewn with plastic bags and other trash left a sour taste in our mouth. We were concerned about whether the visiting tourists and the local operators take pride in the beautiful environment that allow for these incredible experiences. This secondary oasis could be a stunningly beautiful place if it weren’t left to rot. The dunes themselves are not much better. Many sections show signs that visitors simply dumped their trucks of trash on the sand and drove away. The engine revved as we started building up speed towards the top of the massive dune on the edge of the city. At first, I thought, “No problem. This will be smooth saili….”. Then we hit the top of the dune, the front wheels lifted and we drove down the far side at breakneck speed! I looked to my right, where D was sitting, and I was staring straight into his eyes while he looked at me with a Cheshire Cat grin. Being that he’s 3 feet tall, and I’m 6 feet tall, this seemed odd. It was because he was no longer in his seat, but floating about 8 inches above it! I reached my arm over and shoved him back down, confident that I had done my fatherly duty of ensuring his survival. It was instantly obvious that the seat belts were not built for children as small as ours (3 & 6). We took stock of the situation, measured risk and reward and opted to throw caution to the wind and continue on through the desert … holding onto our kids with death grips as we went. How popular is sandboarding in Peru? 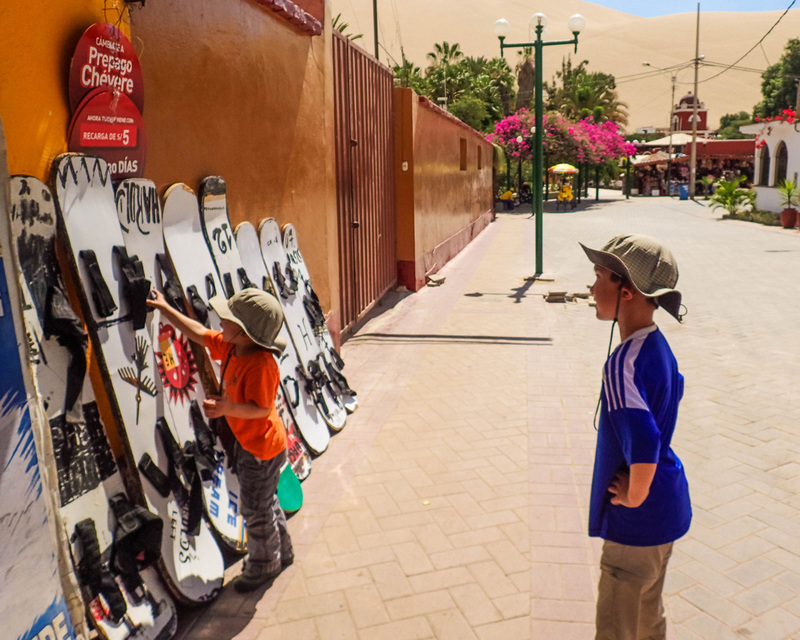 If you wander the streets of Huacachina, it would seem like it’s the most popular sport in the world! After checking out the boards lined up outside the shops in town, the boys were itching to get out on the hills. We stopped the dune buggy at the top of one of the tallest, steepest dunes and hopped out to take in the view. 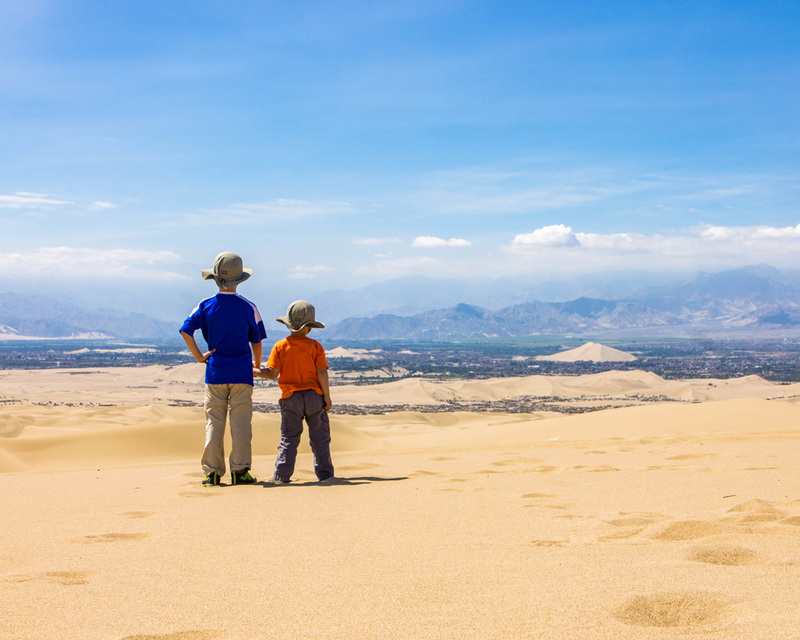 The view of the city of Ica, with the monolithic dune that towers above it, was unforgettable. As beautiful as the view of Ica is from atop the sand dunes, our adrenaline fix needed to be satiated! Alberto was a rookie guide and this was his first time taking part in this kind of action. He had the honor of being the first to creep his board out over the towering edge of the sandy hill. Our dune guide gave us the instructions to steer with our feet and hold on tight to the straps of our board. Within a moment, Alberto took a deep breath and then disappeared with a scream down the hill. D insisted on being next. He had a look of determined ferociousness in his eyes as he got ready to launch his 35 lb body down the side of a sand mountain. He dug in his toes, grit his teeth and went flying down the hill after Alberto. Not to be shown up by a toddler, C rocketed down the hill, laughing the whole way. He was followed by Christina, and finally, I got up the nerve to head down myself! In all, we did three subsequently higher and steeper runs. And what made the adventure even better? The dune buggy came and picked us up after each run, no climbing!! After our epic run, we emptied our shoes of a nearly infinite amount of sand and celebrated with a group photo to celebrate our death-defying achievement! This wild adventure proved to be a great training run for sliding down the Sichuna’s at Sacsaywaman near Cusco. You can read about that adventure here. As we boarded up and made our way back towards town, we stopped at top of the town to take in the beautiful view of Huacachina amidst the surrounding dunes. It’s a magical sight, and with a little TLC, this could be one of the most beautiful towns in the country. 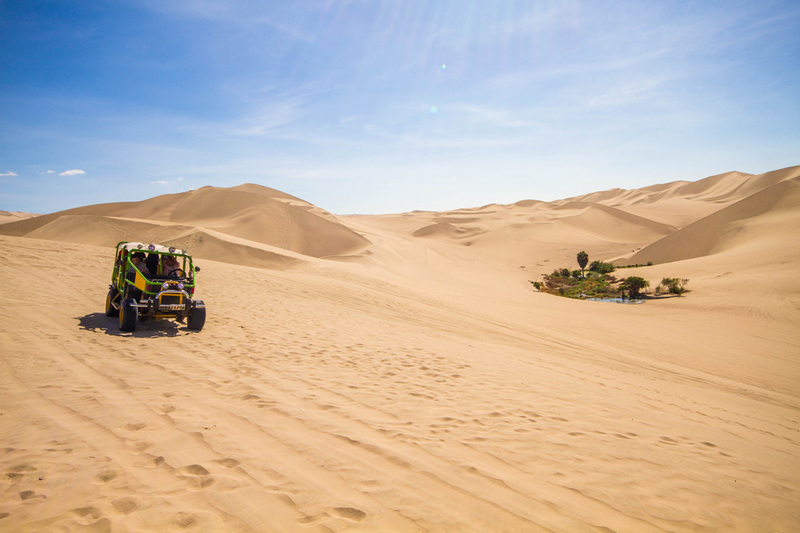 How Much Does it Cost for the Dune Buggy and Sandboarding in Huacachina Experience? 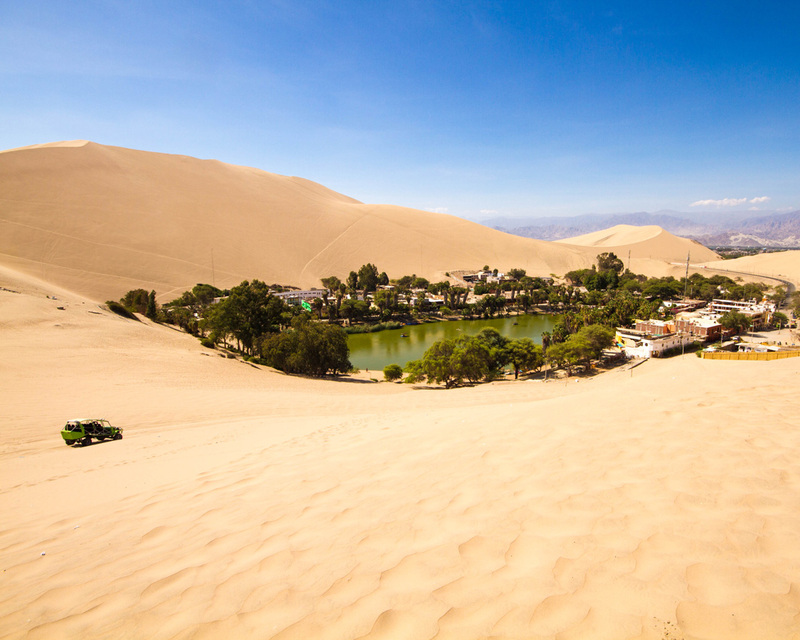 The Huacachina sandboarding tours generally last between 1 and 2 hours. The cost for the tours varies based on the package that you sign up for. 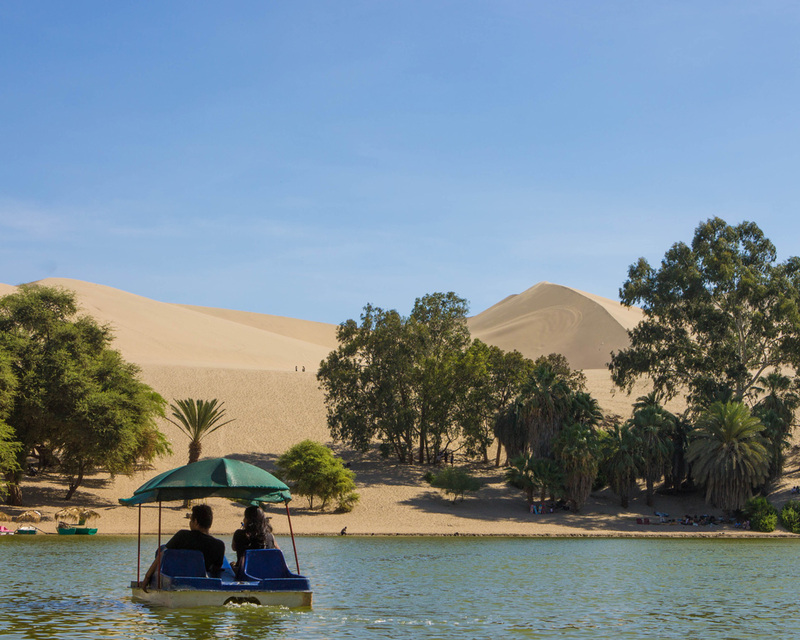 On average, for visitors booking in Ica or Huacachina, the price begins at about $22 USD per person for a group tour. 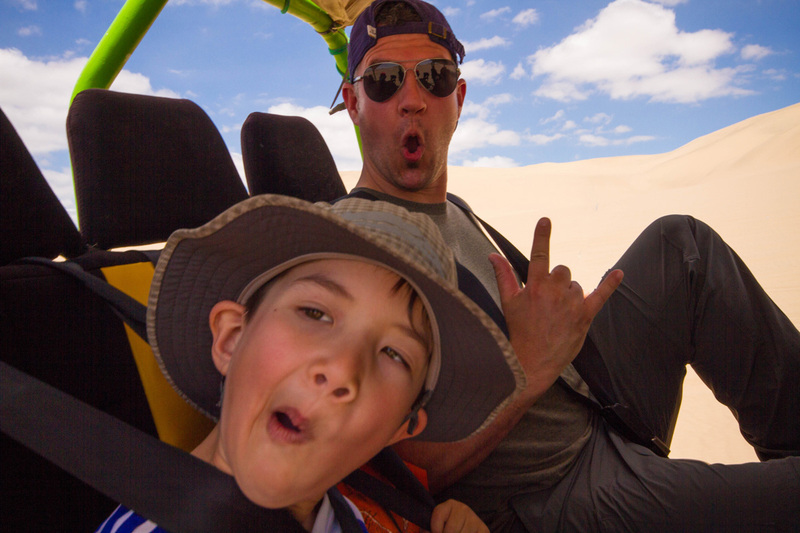 For private dune buggy tours, outings are about $30 USD per person (based on 4 people). This price is on top of the $3.7 Soles entrance fee. 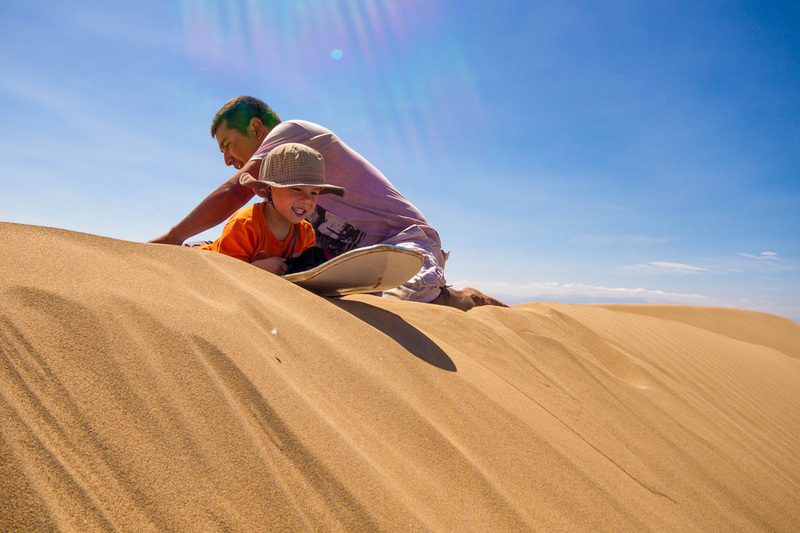 Do We Recommend Sandboarding Peru with Kids? 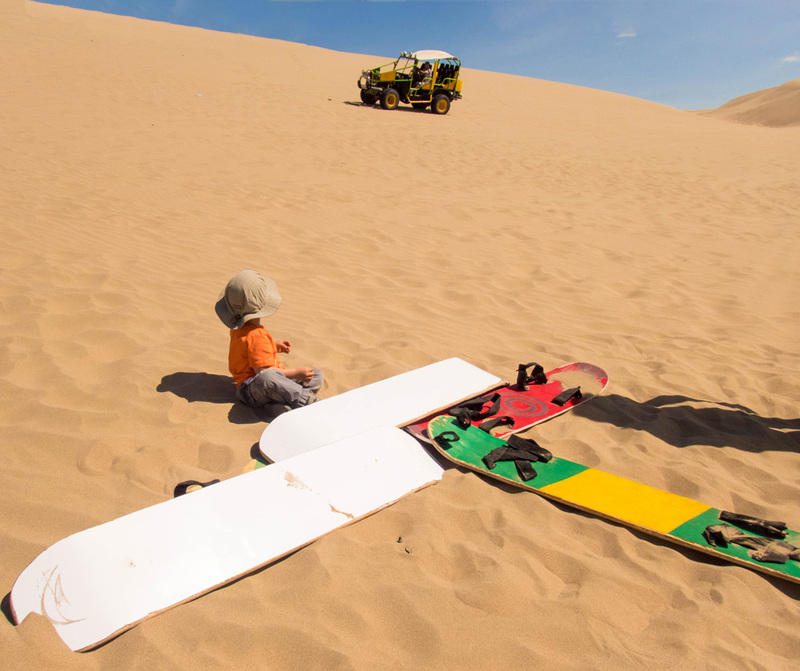 So, riding dune buggies and sandboarding with kids in Huacachina is a bit dangerous. It’s true. Those dune buggies are not really made for children (at least those as young as ours). However, none of the adventures were risky enough to cause more than other adventures we have undertaken, such as learning to ski. 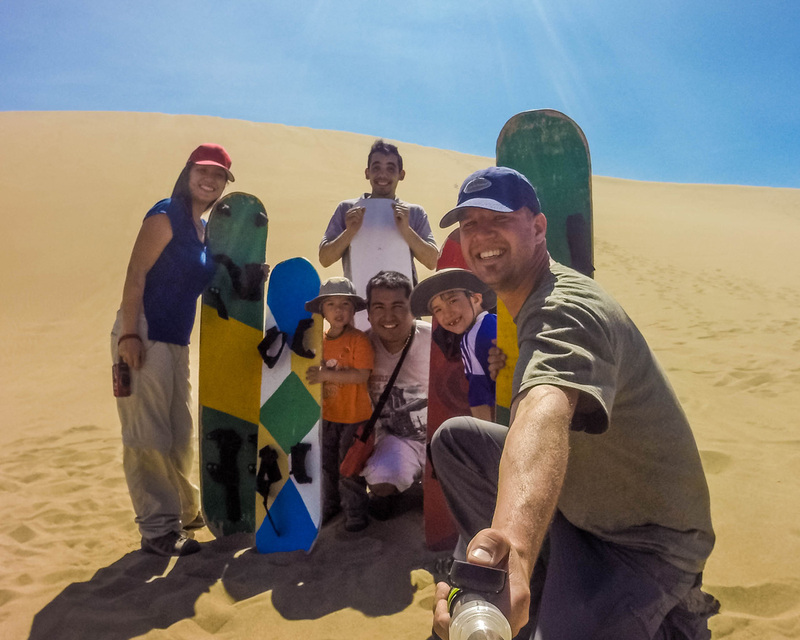 Plus, sandboarding Peru with kids is also EPICALLY AWESOME! For the kids, the excursion was definitely one of the highlights of our family adventures in Peru. In fact, all of us had a wicked time tearing through the desert and shredding the dunes. So in a word, yes. 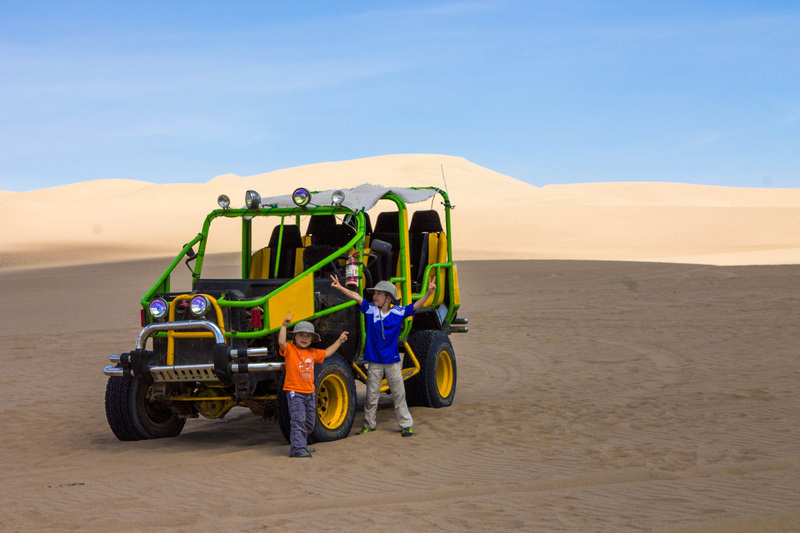 We highly recommend the dune buggy and sandboarding Peru experience! Wow, this looks like so much fun. My kids would have loved both activities at any age, and we would have let them loose at the age of your kids. However, I am sure my family would have told us off, they did that often as our girls grew up. Looks like so much fun! I had a great time sandboarding in Namibia but have yet to ride a dune buggy. Will definitely make sure to do both when I visit Peru. Looks great, not sure it is for us though being pensioners. We would prefer to go hiking in Peru. Would definitely have done it 20 years ago. I’ve never gone dune buggying or sand surfing. Looks fun, though. May need to give it a try! Very cool. 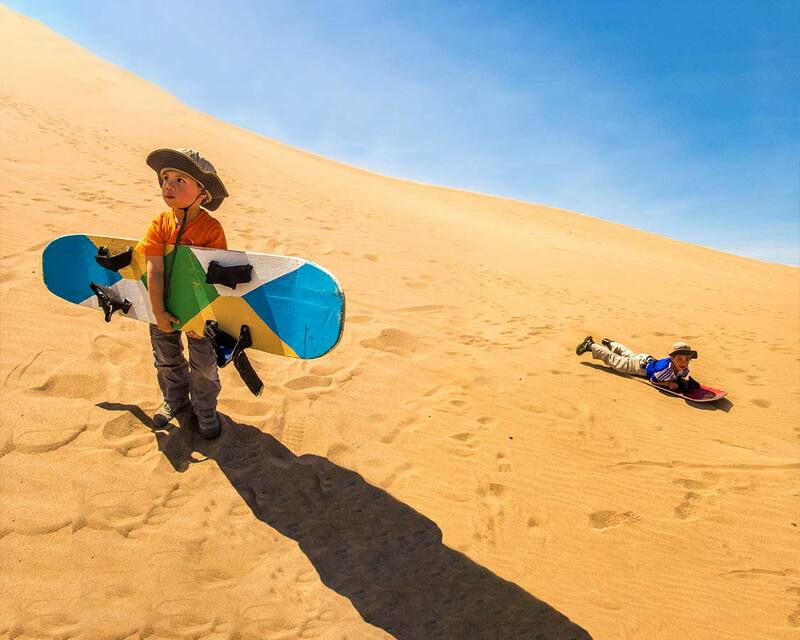 My kids would love to try sand boarding for sure. Loved your video too! This looks such such an amazing place. I would love to head here with my boys. Hi Kevin! Great to read that you did this with a three year old as our youngest would have just turned 3 when we go there in june. Did you hire a private buggy? I’m hoping we can do that plus ask them not to go too crazy. And that tall 7 and 9 year olds should be ok? Holding three of them down may prove too much. To be honest, after breaking my leg in thailand last year, I feel uneasy about even sandboarding myself! We did hire a private buggy (it was a 5-seater, but I saw some that seat up to 7). C, at 5-years-old, had no issues staying in his seat. Only our 3-year old was tossed around a bit. Although I’ll admit that he absolutely loved “catching air”. You have no pressure to sandboard yourself. You can always catch a ride down on the buggy for the trip up and down. You can also choose to lay down on the boards sled-style for a more comfortable ride. It’s a far less dangerous way of tackling the sand dunes than standing up.